MANHATTAN, Kan. – The Kansas Forest Service fire staff will conduct planned burns March 22-28 as part of its 11th annual Hazardous Fuels Mitigation Project. In this case, the fuel is several years of accumulated brush. The burns will be at Sand Hills State Park, Prairie Dunes Country Club and surrounding areas near Hutchinson, Kansas. The Hutchinson area was chosen due to its susceptibility to wildfire. The area has had some of the largest and most destructive wildfires in Kansas, according to Eric Ward, fire planning specialist with the Kansas Forest Service. 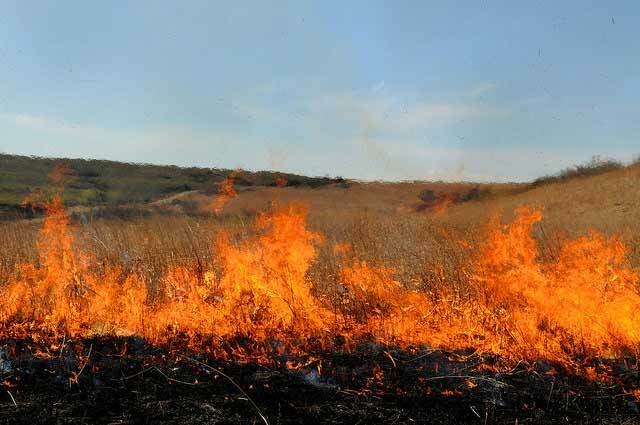 However, this area’s natural prairie habitat is fire dependent. The project will be managed by nationally-certified wildland firefighters from Kansas and surrounding states. Hutchinson Community College fire science students will also participate to further their classroom training by preparing and participating in an actual fire situation. Run like a national wildfire incident with the Incident Management System in place, this event has attracted qualified firefighters from six states and 16 different agencies. “This year also marks the first time that the local fire department, Hutchinson Fire, has played a key role in the organization and implementation of the project,” said Ward, who is serving as the incident commander for the project. KFS receives a grant from the U.S. Forest Service each year to help fund the project. The grant is designed to cover the cost of fuel reduction on public lands where adjacent life or property could be harmed in the event of a wildfire.